I start my day with a cup of a tea made from a bagged tea. We have been drinking the Irish Breakfast Blend of a national grocery chain for the past six months but we like to experiment so when Assam1860 reached out to me to try its finalized Assam, I said yes. I reviewed the company's original Assam last year. You can read about the company on its website -- www.assam1860.com -- but I would like to point out that Assam1860 is Rainforest Alliance Certified which means the tea estates are "managed according to rigorous environmental, social and economic criteria designed to conserve wildlife; safeguard soils and waterways; protect workers, their families and local communities; and increase livelihoods in order to achieve true, long-term sustainability." The company is also a member of the Ethical Tea Partnership. I am less familiar with ETP but it is an organization I am following (literally on Twitter) and its members adhere to a set of social (think safe working conditions, fair wages, bargaining rights, etc.) and environmental standards which align with other certifying bodies. You can read more here. The steeped tea is strong in a good way. Brisk but not harsh. The flavours are what one would expect from an Assam. The color of liquor is similar to a Mahogany Crayola crayon or somewhere between the Brick Red and Chestnut Crayola crayons. I have prepared many cups of this tea. It is especially delicious with milk. Malty notes emerge. The new formulation is good with milk, too, but the overall taste is not as deep - complex - as the former version. The instructed steep time is 2 minutes which yields a tight cup of tea. The photo above shows a cup steeped for 2 minutes, and you can see that it matches the "ideal color" show on the tea bag tag. 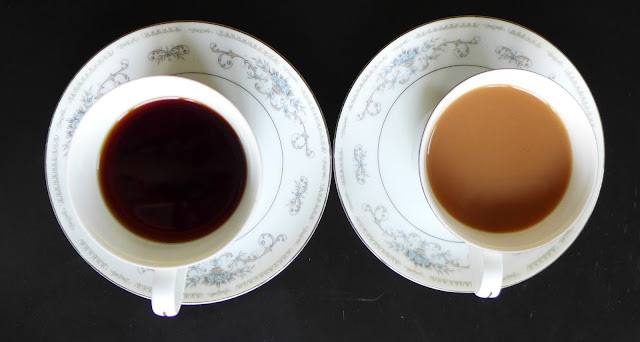 The cup shown on the right was steeped for 5 minutes and milk added. We found that a longer steep produces a brisk but less sharp liquor. Also, the classic malty note shows up with a longer steep. Although I was more enthusiastic about the first iteration of Assam1860, we have drunken almost all of the new tea. I recommend a longer steep time, and perhaps even removing the tea and preparing it in a fine mesh infuser cup. Thanks for such a beautiful review! We are sorry to hear you liked our previous packaging more! We will work on a more environmentally friendly tea bags in our future packaging.